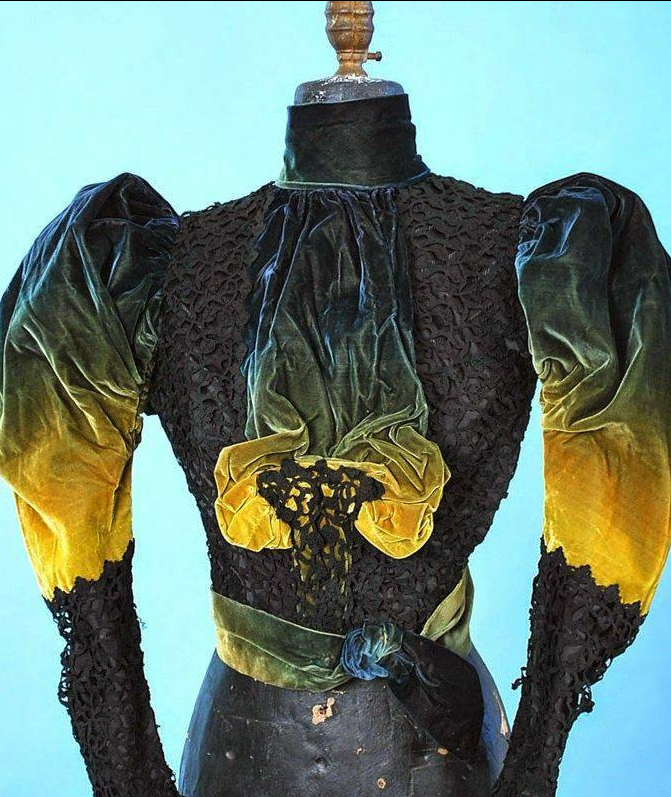 Yes, this is an original gown dated back to the 1890s. Yes it’s ombré velvet. Yes, when I saw it posted on a group, asking if it was blue dye on yellow or viceversa, I wanted to rameke it. 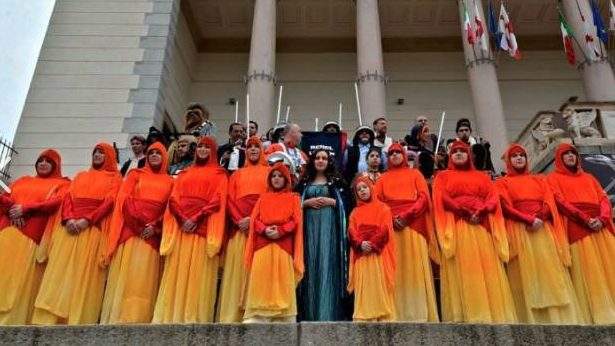 And guess who had a flame handmaiden dress worn twice that she never wanted to wear again because of memories? 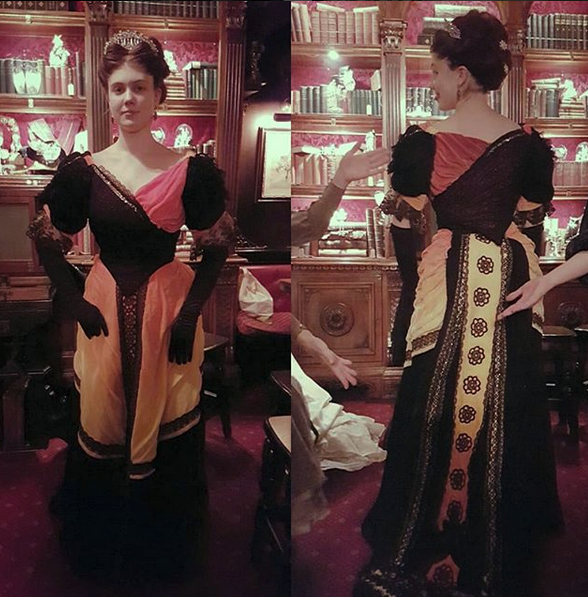 So i decided to take this challenge, making the ombré gown using only the silk velvet I had from the handmaidens, all the leftovers, all the dyed and replaced pieces, all in one gown. I will alter the design a bit. First, there’s no skirt for the original. So I will make mine. 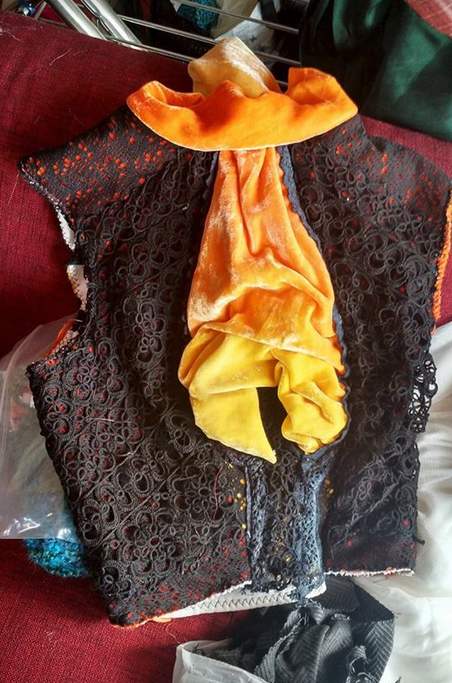 It will be in lace, and will have the “lava falls” on the side, as in the one at the center of the bodice. I will also change the sleeves. I will add some “bouffant” partys there too, making them huuuuuge. 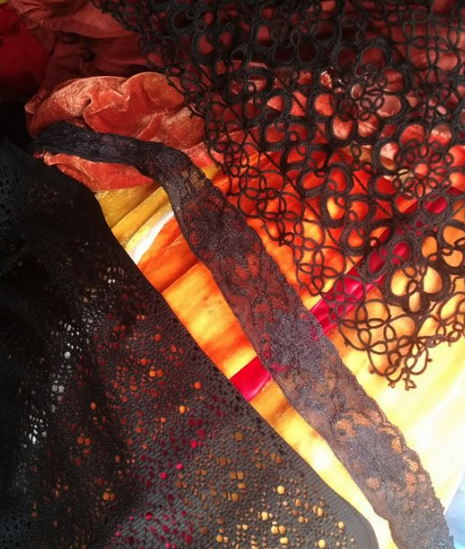 I have purchased some handmade lace and some modern one. I dyed the handmade in black. 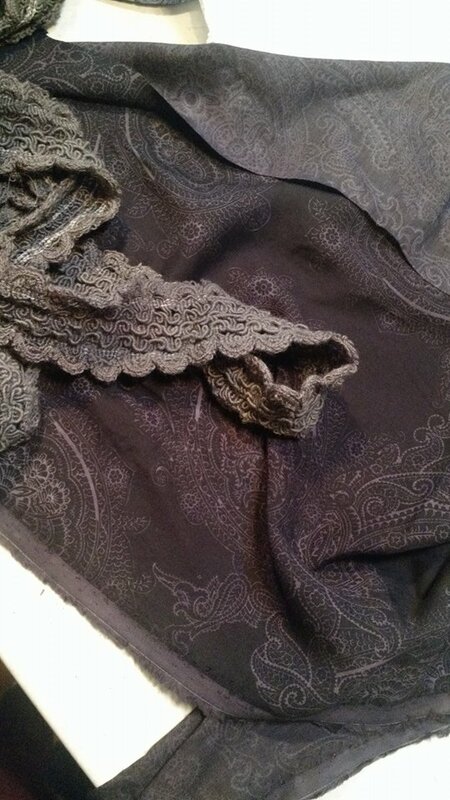 Mix and match with lace pattern was not a crime back then. And as I am a huge fan of adding some weird looking details to already weird looking designs of the time, I bought crystals. 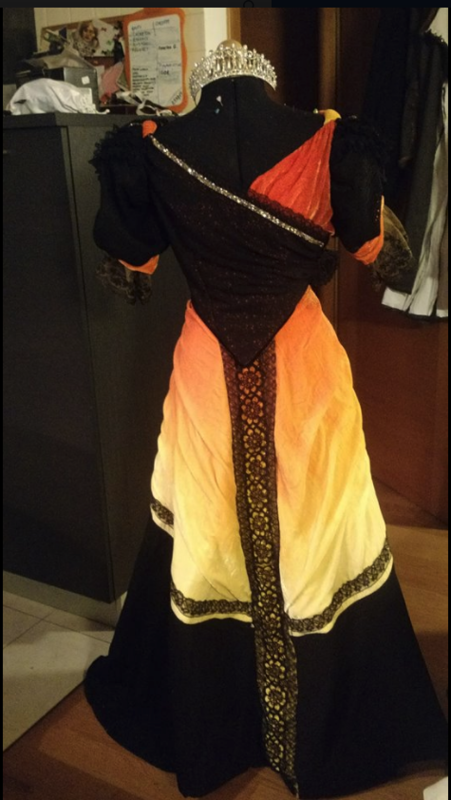 I still fear it will look more a sci-fi-fantasy gown, but at’s wrong with it? It will look glorious! 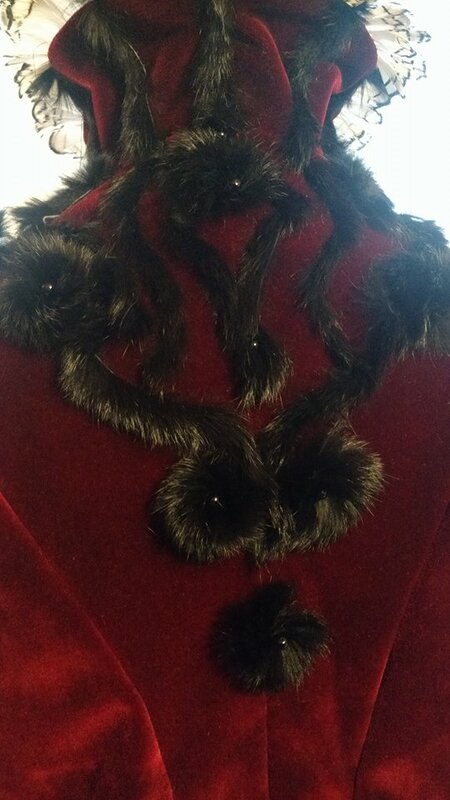 The shimmering velvet looking almost incandescent, the black lace, the quartz beads and the amazing antique taxidermy hat I have purchased some time ago. I’ll love it. Hope you will too. 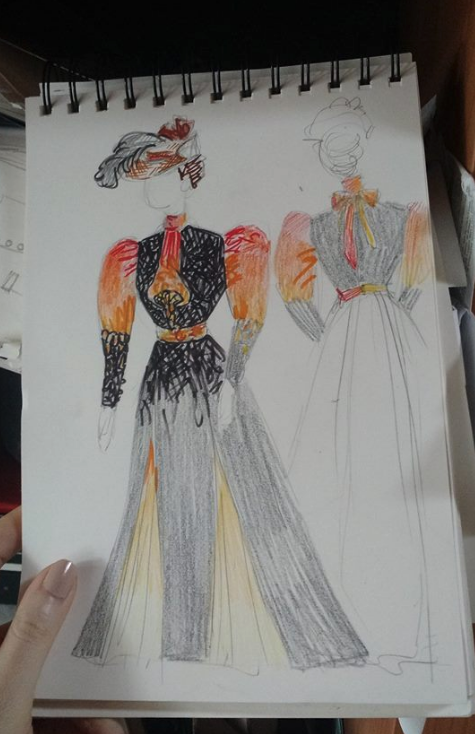 I have drafted the pattern using both Janet Arnold’s books and Creating Historical Clothes. The second one is easy to manage if you have some technical drawign skills, the first one helps to fix those approximations the modern book makes to achieve easy to use patterns. But then if you have a specific design in mind you have to alter both of them. 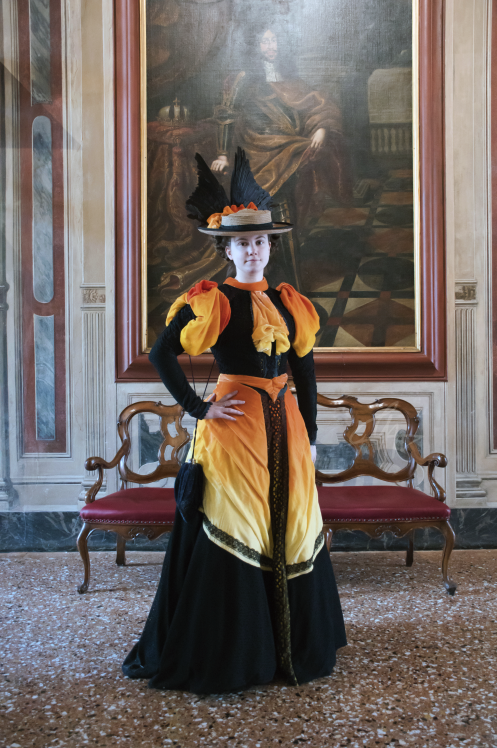 I didn’t make a toile, I have my basic 1890s bodice pattern, made for other dresses which fits quite well, so I re-drafted it and I cut the fabric. 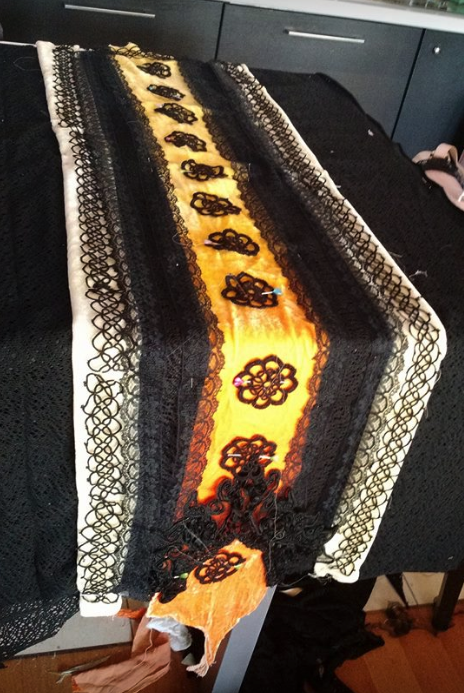 I flatlined it all with cotton, and I overlayed velvet and the two types of lace. I will add boning later. 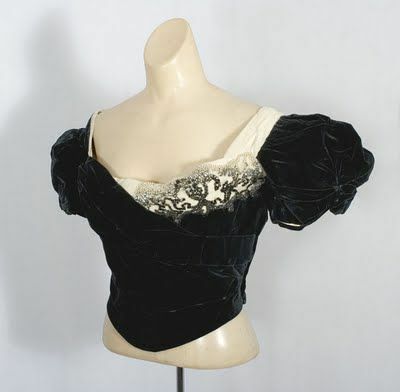 On the right you can see the main reference for the bodice. 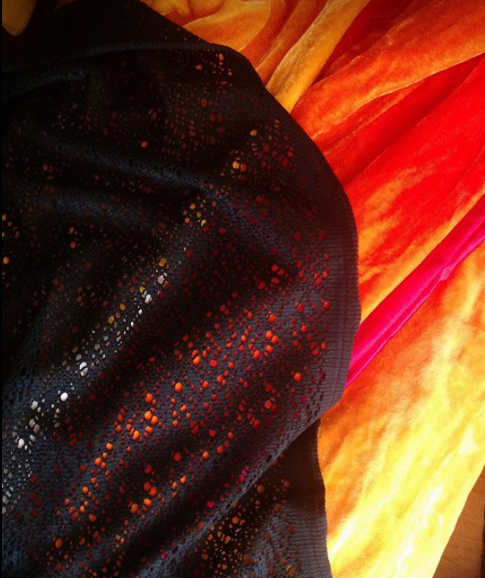 I improvised for the skirt, mixing and matching with the supplies I had left. 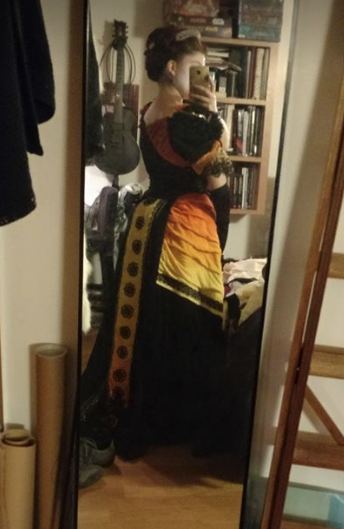 Could use some improvements, but I had to wear it for an event, and so it was fixed and finished to go. 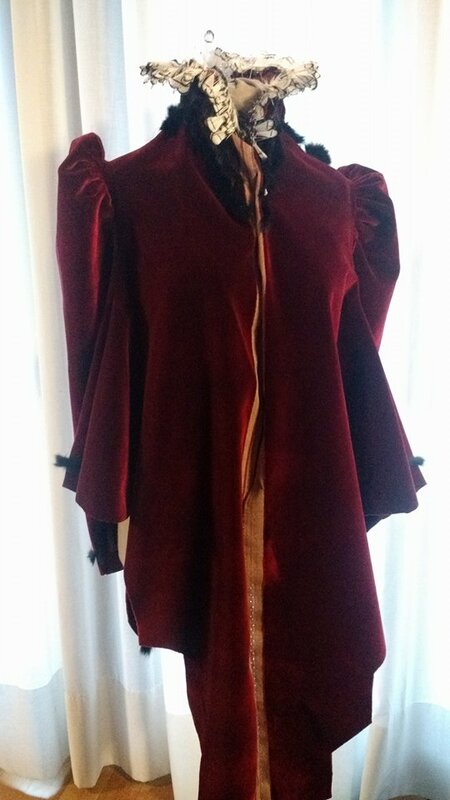 I decided to make a robe-à-transformation of it, which is a skirt with a day and an evening bodice. 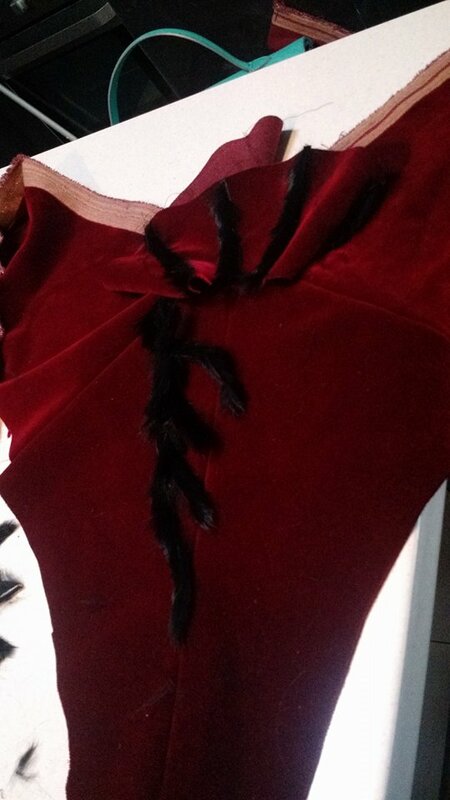 The evening bodice was bit tricky, but I like how it turned out. 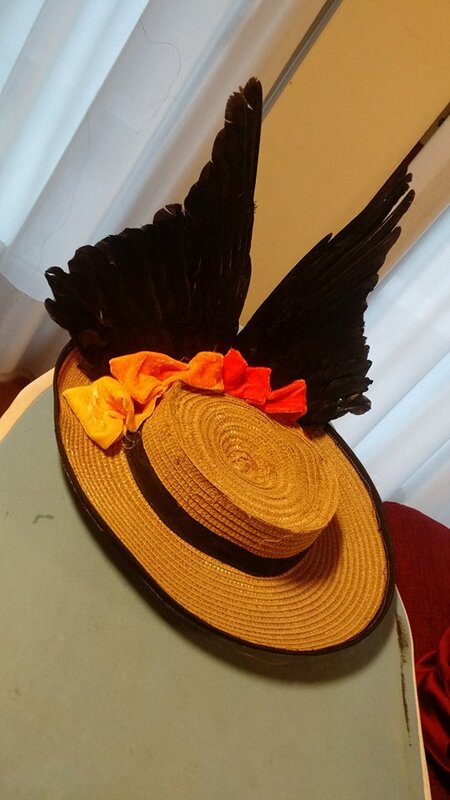 Now it’s time to complete the day one, and to make a wonderful hat out of the pair of crown wings I had from etsy! 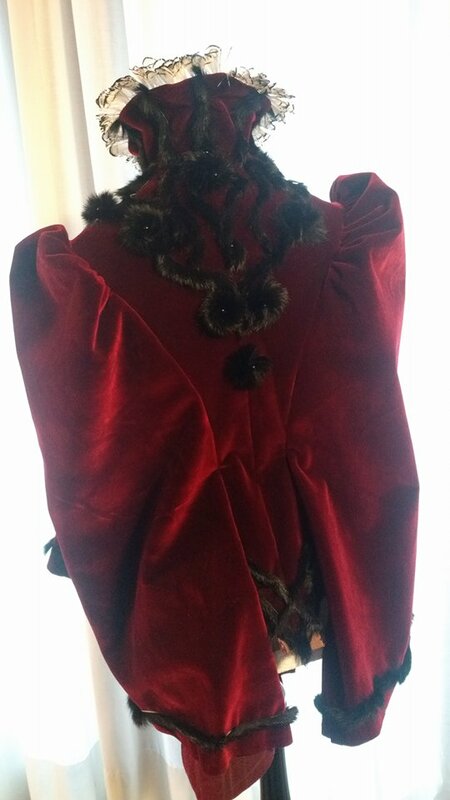 After getting the evening gown roughly one for the soirée, I planned to complete its jacket for the day version. However, I did not proceed with it. 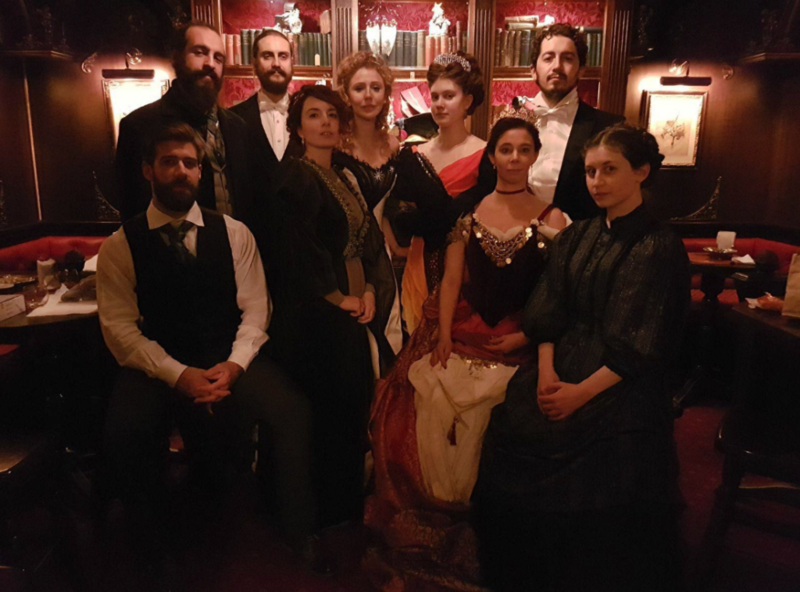 I made a new and better petticoat to let the skirt achieve the proper 1890s shape.